Today is the start of a new Embellish Color Challenge! Take a look... The challenge: To use the colors pictured above and a quirky-cutesy-clean style. 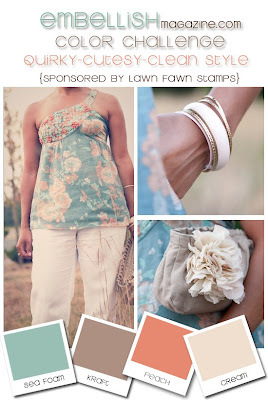 The fabulous sponsor: Lawn Fawn. Lawn Fawn (brought to you by the adorable Kelly Marie) is such a fun and unique stamp company, perfect for a challenge like this one. I am working with a set I couldn't wait to get my hands on, Bake Me A Cake! Love it, I've got all kinds of ideas for this set floating around in my head, just itching to get out. Here is what I came up with... A fun Topsy Turvy Birthday Cake! Started with some Melon Berry cardstock then, stamped the first layer at an angle, masked off the top (with a Post It Note) and stamped the next layer at the opposite angle. Continued this process all the way to the top. Cut the cake out, embossed with the Sunshine Impression Plate and embellished with a few hand cut Vintage Cream flowers. Set the cake atop an Aqua Mist cake stand and attached it to a Vintage Cream cardstock strip. Just below the Vintage Cream strip, I attached half of an Aqua Mist Fillable Frames #4 die cut. Then finished it off with a Melon Berry satin ribbon bow and sentiment. Now it's your turn to join in the quirky-cutesy-clean fun! Look here for the challenge details, amazing inspiration and a fabulous prize. Hope to see your challenge creations soon! this is so sweet! love the texture on the cake! Maile, Great card...love the embossing on the present! Absolutely adorable Maile! Just adorable. ooo, Maile! this is just lovely. love the aqua peaking out from the bottom. Oh, oh, oh! What an adorable card. You make me want to buy that set...I love it. So clean and pretty and the impressed cake is fabulous! So pretty! 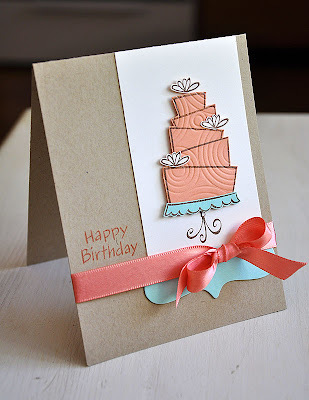 I love the colors and the cake stamp! I love this! What a great idea to use the impression plate how you did. As always, your work is so inspiring. I LOVE your card Maile, particularly how you embossed your cake, so pretty! Just adorable, Maile. :) I absolutely love this stamp set...One of my favorites right now!! Yummy. Love the topsy-turvy looking cake and the colors look fabulous together. 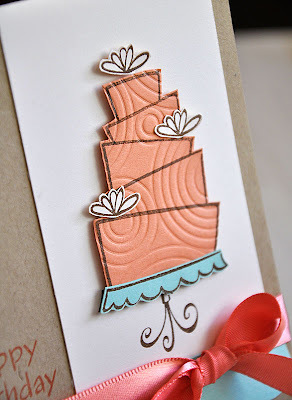 Love the topsy turvy textured cake!! And that color combo ROCKS!! I love the way you've made such a topsy turvey cake - the colours look gorgeous like this! And those little flowers you've added to the layers are wonderful!